Choosing to be a player means, basically, you’re taking the route of the old Superstar mode; choosing to be a coach means you’re embarking on Franchise. 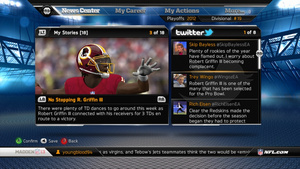 The difference this year is that Connected Careers’ online component means you and up to 31 other friends can play as different players and coaches in the same league, and thus have your personal stories play out together (though you will not, as a single player, be able to play on a team controlled by another user coach). You may play an offline singleplayer connected career mode if you just want to take your coach or player up against entirely CPU competition. You can also set up a solo online career allowing just one entrant, setting the league to private, if you want to access the online features—which includes a league Facebook page and Twitter account that will auto-publish its fictitious developments. Don’t want players and coaches commingling? You can set the league to be only players or only coaches. A virtual Twitter feed, featuring commentary from the newshound Adam Schefter to the bombastic Skip Bayless, will chart your league’s events and even tip off your opponents to your plans. Josh Looman, the mode’s top designer, specifically wanted a grind mechanic for Connected Careers and chose to deliver it through practice. It’s important that it’s available there, as it keeps live contests from becoming do-or-die with an underpowered character, potentially setting up a very tough, slow haul to improvement. Coaches also earn XP, and their players also will progress, based on their teams’ improvement. For coaches, XP can go to administrative perks. If, as a coach, you work out a player with an eye toward him as a high draft pick, Adam Schefter’s Twitter will react to that, and could potentially tip off others in the league to your plans. Skip Bayless’ Twitter will be just as vapid and cliché strewn as the man himself, one assumes. As to un-retirements, I specifically asked if Ed Werder, Rachel Nichols, or Brett Favre had licensed their appearances in this game. No, no and no were the replies. So rest easy there. A big reason for creating Connected Careers was to create economies in development, Looman said. 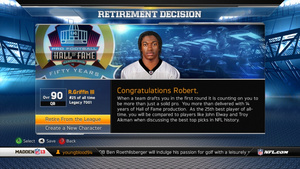 Each year, Madden‘s makers had to decide what would get attention in the main mode, in Franchise, or in Superstar, and inevitably something would get neglected—Superstar especially. Looman later suggested on Twitter that edited roster support may make it into the game later—”We just ran out of time,” getting it into Madden NFL 13, he said. Whether he means this can be patched in later, or will have to wait for next year’s game, is unclear. But if that lack of control is off-putting enough to be a deal-breaker, then this version will not be for you. If your career plateaus or bottoms out or simply becomes uninteresting, there’s no reason to leave the league or start over. Just retire the player or coach, and pick another. Another feature some, but not all, used was the means to play any game on the schedule in the old Franchise mode. After playing your team’s game, if there was another game in that week that appealed to you, you could take control and play it as either team. That’s no longer possible in Connected Careers, likely to keep griefers from sabotaging the results by throwing games. Again, if playing one-off games with teams you weren’t controlling was something you counted on, Madden 13 isn’t for you. As to griefing, I was reassured by Looman that human players will not be able to forcibly retire superstars in their league in order to lower the competition or thin out a free agency pool. 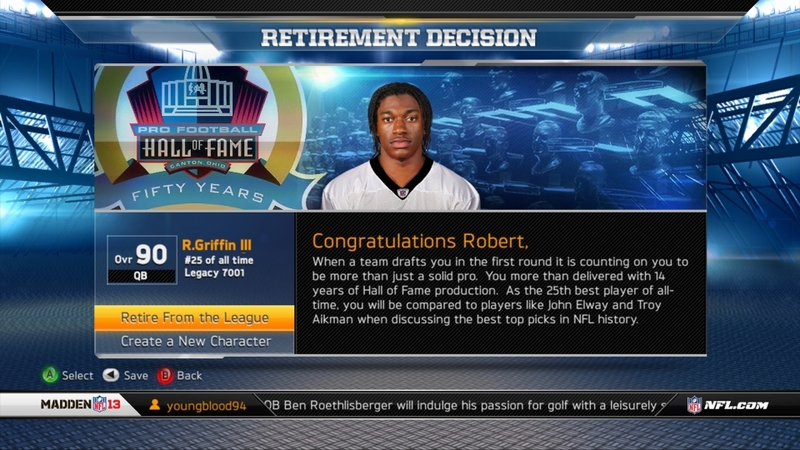 You may retire at any point as a real player or coach—he will still remain in the league, and will perform as a CPU-controlled entity, until retiring according to the game’s career-length logic. That leads us to what I think the real value of Connected Careers will be, over time. How many times have you lost momentum in a Franchise or Superstar mode because you either had a player who wasn’t performing, a team who wasn’t interesting, or because the experience was no longer challenging? Instead of restarting either mode, now you simply retire your coach or player, choose another, and start fresh from that point in the timeline, without resetting the game and starting over from year one. Connected Careers will support a continuity lasting up to 30 season. In the offseason, the Cardinals replaced Young with Drew Brees out of free agency. New Orleans then signed Young’s quarterback to mentor their first-round draft pick and be a starter for at least the next half a season. It all evolved so naturally, Looman couldn’t help but share the story with me. But, he said, creating one-off players that old might lead to bugs in the mode that have yet to be identified or fixed in testing, so Madden can’t commit to giving you the means of creating anyone older than a player in his early 20s. I hope they can make that fit in time for the game’s release. Connected Careers’ retirement mechanic addresses one of the big drawbacks of career modes—they are so long that very few ever make it to “the end” of a career, much less 10 seasons. Allowing a player to create an old veteran in his final year or two would offer a compact, end-of-career experience that many folks—even if they’re only old timers like me—would enjoy.